Two Years with My Chevrolet Bolt EV! Today marks two years of my life spent with my Bolt EV. It’s been a great ride, so far since that rainy January 8, 2017 when I took delivery (below). As a longtime automotive writer (27 years), I approached Bolt ownership as a very long-term test. I remembered my wonderful three-month test of a Fiat 500e in the first quarter of 2016, and assumed that I’d take an analytical approach once my new car arrived. What I’ve found is that unlike the standard week-long evaluation, living with a car for years makes it really “yours.” I now have to deal with dust on the dashboard, used kleenexes in the cupholder, and the light gray and white leather seats need cleaning. But as an EV, the car has needed exactly zero maintenance. I’m planning to take it in soon for belated tire rotation and a general inspection. The main reason to have an electric car of my own was to truly experience life with one. I assumed that if I was going to prescribe switching to EVs to my readers, I had better “walk the walk” and not just “talk the talk.” It’s easy to have a car for a week and give it a glowing report. But this was meant to be a long-term relationship. I leased my Kinetic Blue Bolt for three years at 10K miles a year, assuming that there’d be better choices down the line and also that that number of miles made sense with my periodic testing. As it turns out, I hit 20,000 miles on December 27 on my way home from work. Perfect. 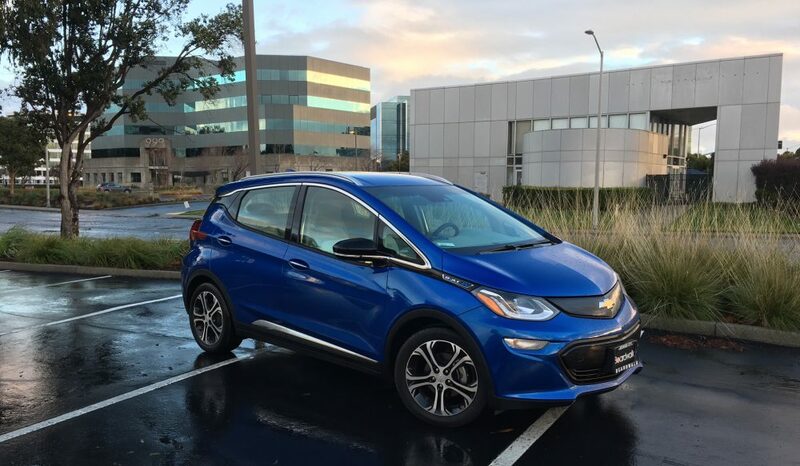 I’ve tested 34 hybrid, plug-in hybrid, electric, and fuel-cell vehicles since my Bolt arrived. I always use my car as a comparison vehicle. Is it as easy to drive? How are the seats? How much range is available? How does the regenerative braking work? Especially these last two questions are crucial for electric vehicles. Regarding range, my Bolt’s EPA 238 miles of range eliminates most of the problems that early LEAF drivers experienced, with around 80 miles available. I only experienced a couple of times where I couldn’t use my car and instead opted for an alternative. In one case, I had to attend a chamber music workshop last summer that was 300 miles away, with few charging stations of any kind on the way. I opted for a gasoline-powered test car. Recently, I drove my car for a few days without a recharge and I found myself with 50 miles range. Based on that, I chose to go to a nearer destination than I originally intended because I wasn’t sure I’d be able to charge up where I was headed and make it home. Oddly, it was at a shopping center that had NO charging stations. Seemed odd, since they are often located there. Easy access to charging is still an issue for EV drivers, although it is improving, and many more stations are coming. I normally can do fine charging at work or at home. Regenerative braking is the way that hybrids like the Toyota Prius get all of their power, since they have no plugs. For EVs, it’s a way to extend range, and also enables one-pedal driving. When I put my Bolt into “L” mode (instead of “D”) using the shift lever, I can press down on the accelerator to move forward and release it to slow down. With the Bolt, you can literally come to a complete stop in this mode. I’ve honed my skills to where I can see a red light ahead and ease off on the pedal and arrive right at the line without touching the brake pedal. You can imagine how long my brake pads should last! Some cars have adjustable amounts of regeneration, and some release the regen at a few miles per hour, necessitating the brake. But my Bolt lets me stop on a dime. One requirement for getting an EV was I had to be able to travel the 85 miles to my granddaughters and back without having to charge. With 238 miles, this is no sweat, but I’ve noticed that in colder winter weather, my car’s range goes down a bit. It’s now closer to 200, and that means it’s a little dicier. On Christmas day, I arrived at my family destination with about a half battery of charge left. Just to be safe, I plugged into my son’s household current (level 1 – 120 volts) and partially refilled the battery overnight. During the two years, most of my charging has happened at work, at the row of ChargePoint chargers. It takes a couple to several hours to fill the battery, depending on how much it’s depleted. I sometimes just skip charging, since there’s plenty there, but it’s nice to keep it topped up. Starting in April, I’ll charge at home using my new solar panels. I’ve gotten the official 238 miles of charge that the EPA gives the Bolt, but in colder temperatures, and if I’ve driven on the freeway a lot, it averages more like 200 or so, which is normally plenty. Right now, it’s saying about 185 or 190 when it’s “full,” so I’m going to have my dealer check it when they look over the car at it’s “two year inspection.” Of course, there will be no oil change or radiator flush (there aren’t any). They’ll rotate the tires, which is an overdue service (at no charge). The Bolt has cost me zero dollars and time in maintenance. The electricity I’ve bought at work costs less than half the price of gasoline. I’ve also saved half off my bridge tolls by getting my stickers to drive in the carpool lane alone ($22/year). Just before the new year, I stuck new red ones over the original white ones, so I can continue saving time and money. The stickers last until January 1, 2022. With my own EV, I’ve participated in a bunch of electric car events, including a couple I hosted at my office for National Drive Electric Week. These events give prospective owners a chance to sample EVs without salespeople or pressure. We usually let the people ride in and sometimes, even drive our cars so they can understand how great EVs are. I’ll be doing more company things this year, looking toward the first annual Drive Electric Earth Day events. But manufacturers have a whole fleet of new EVs coming in the next few years that will make choosing an EV easy. The Hyundai Kona small crossover EV should be on sale now. I’ve driven the gas version and seen the EV at the auto show, and it’s the kind of small, usable car I like. It’s compact, but unlike the Bolt, it’s a crossover, not a tall hatchback (a fine but important distinction) and with an EPA-rated 258 miles of range and a lower price than the Bolt, it should make a big impact. The Tesla Model 3 has been the big EV star in 2018, selling a whopping 145,846 cars, which dwarfs EV sales by the other companies and is a big number for almost any model. Maybe it’s the Tesla magic, or the fact that it looks like an attractive sedan. It’s more expensive than a Bolt, but that doesn’t seem to have prevented it from proliferating. My car’s hatchback configuration has proven to be exactly what I need to carry my musical gear. An upright bass slides right in. I even found a way to carry the big bass plus two bass guitars, an amplifier, and my cords, cables, stands, etc. When not hauling gear, there is plenty of room for two adults in the back (and room for a kid in the middle, if necessary). The low window line up front gives the Bolt a spacious feel, as does my car’s light gray and white interior. I chose the brighter dash, seats, and doors when I placed my order without knowing exactly what it would look like. The car I saw at the auto show that year had the black and dark gray interior, which I believe is the standard one. The only downside is the tendency of the light gray upper dash panel to reflect in the windshield, but with polarized sunglasses, it’s never a worry. Electric cars have great torque, and my little car can really take off when I step on it. I rarely push it, as it’s a waste of battery charge, but accelerating up an on ramp is fun. The 6.3-second zero-to-60 time is equivalent to a sporty Volkswagen GTI. With 900+ pounds of battery below the floor, the Bolt boasts a low center of gravity, which means stability in curves. I now have a year to enjoy the Bolt before it’s time to turn it in. What should I do? I know there are lots of new cars on the way from VW, Mercedes-Benz, Audi, BMW, Volvo, and others. The Hyundai Kona and Kia Niro crossovers are compelling (and affordable), as is the third-generation Kia Soul (if you like boxes). GM may have another all-electric available in a year–the concept images look impressive. The MINI EV is due by year’s end, too. Further upscale, the all-new Mercedes EQC–the first of the brand’s new EQ lineup of electrics–was introduced today at the Consumer Electronics Show (CES) in Las Vegas. Should I see what kind of a deal I can get to just buy the Bolt? I have time to think about it. I never expected to drive a Chevrolet, frankly. Although my family had Chevys when I was growing up, including a few Corvairs, I always owned old VWs and new Hondas and Toyotas. Domestic vehicles didn’t have high quality years ago, although I did try the first year Saturn. The good news is, today the domestic brands have quality parity with the leaders. Other than a couple of minor electric glitches (that didn’t affect driving) and one loose plastic clip in the rear cargo area, the Bolt has been rock solid. Yes, the interior isn’t luxurious, but I still appreciate it’s flowing design every day. The 10.2-inch center screen is great to work with. Apple CarPlay is sublime, as is the Bose sound in my upgraded audio system. The seats, which some buyers complained about, work fine for me. I’ll continue to write about my Bolt this year, and as 2019 winds down, I’ll share my thoughts about the future with you. Please continue to check here for stories about going green. You can read all of my EV stories at www.cleanfleetreport.com. Refrigerator Water Filters – NOT Recyclable? On January 1st, I finally got around to changing the water filter in my Kenmore refrigerator. As I set the old one down on the kitchen counter, I wondered how I could recycle it. After, all, it’s an 11.5-inch long blue plastic tube, and why should it end up in a landfill? I looked over the printed materials that came with the replacement filter, and studied every inch of the filter itself and found nothing about recycling. So, I went onto Google. There I was offered information on a recycling program that was started in 2014. A ha! I found a mention of a kit you could use to bag up the filter and send it in. I saw an email link to everydropwater.com and sent of a request for more information. I received a prompt email reply from Heather, an e-Solutions Specialist, who thanked me for contacting them (they “appreciated hearing from me”). She apologized for the inconvenience. What next? I tried Waste Management, my local garbage and recycling company. I emailed the sustainability group at my office–volunteers who think about these issues. I also checked online some more. One post suggested opening the filter (somehow), then putting the contents in your garden (is this a good idea?) and then washing the plastic case and placing it in your normal recycling bin, if your company accepts it. I’ll figured I could try that, but if it’s this difficult to recycle these filters, then it’s no surprise that few folks bother to do it. I attempted to open the plastic case using a big wrench from my toolbox but it didn’t budge. I decided not to proceed with trying to saw it open. For now, I’m keeping the filter around while I plan my next step. I’ll explore this issue further and will report back any findings. If you have any suggestions, please send them to me at sdsauto53@gmail.com.